While I never change a forecast once it's published, I do post errata here to acknowledge typographical errors and the like. I haven't spotted anything in the current forecast yet. If you do, please let me know. Thank you! My September 2008 forecast mistakenly describes the Mercury-Sun alignment of October 6 as an inferior conjunction. In fact, the proper nomenclature is just the reverse: it is indeed a superior conjunction. (Inferior refers to an inner planet passing between Earth and Sun, while a superior conjunction occurs with the Sun between the inner planet and Earth.) I know better, but I misspoke. Don't you just hate when that happens! The last paragraph of my December forecast contains a mistype, in the passage discussing the origin of "Helicopter Ben’s" nickname. Where it reads "as a way of fighting inflation", it should read "as a way of fighting deflation". The earlier part of that sentence does correctly refer to deflation as the motivation for dumping money into the economy. Much to my chagrin, I misspelled the name of one of my favorite poets in the March forecast. Thanks to my friend and colleague Jim Tate for bringing this one to my attention. There's no defense for this, which is equivalent to writing W. B. Yates or something of the sort. It may be that living for 25 years just off (or around the corner from) Elliot Road has warped my simple mind. I've got a few corrections for you with regard to my April forecast - again, thanks to Jim Tate for pointing me to two of these. First, as with the March forecast - thanks to the miracle of copy-and-paste - there's an extra "l" in the name of one of my favorite poets: it should read T. S. Eliot, of course. And then there's a g-for-a-q typo in calling out the "Iraq-Iran border". Finally - for now, at any rate - the paragraph of my April 2009 forecast discussing the generations of Americans who have lived under a fiat monetary system has a mistype, in the passage that reads "the US went off the gold standard internationally in 1973". (Thanks to "Professor von Braun" for spotting this one and alerting me to it.) The year that President Nixon closed the gold window was NOT 1973, but 1971; as stated many times in previous forecasts referring back to this era in history, which occurred under the aegis of the 1971-1972 triple Saturn-Neptune opposition in Gemini-Sagittarius. In my 2010 World Forecast Highlights, there is a transposition of the alternate name for Venus Vespers, which is Venus Hesperus, to the sentence discussing Venus Lucifer. To be clear, the passage should read. "Venus Max begins with Venus as evening star (Venus Vesper, aka Venus Hesperus) reaching maximum elongation east of the Sun at 12° 57’ Libra on August 20, conjunct Mars and smack in the middle of the Great 2010 T-Square. The cycle ends with Venus the morning star (Venus Lucifer) attaining its greatest western elongation on January 8, 2011 at 1° 11’ Sagittarius." My November 2010 Forecast, in the paragraph discussing the Mercury-Mars meridian line, is actually quite miraculous; in that it bestows Austria with a west coast on the same meridian as Hong Kong. This of course is only possible in the Universe in which Austria is where Australia is in our Universe. Thanks to Douglas Chalmers for pointing out this typographical error, which substitutes the Osterreich for the Land Down Under. Speaking of eclipses, please note, under that heading in my 2011 World Forecast Highlights (at the bottom of page 21 in the print edition), that there are a total of six eclipses this year as stated. However, this total comprises four partial solar ecipses (not five). I don't know why I mentioned five partial solar eclipses in that section, when I specifically described the actual four in the following text. Rats! Due to an eye problem, I missed a few sloppy errors in the December 2011 Forecast - some obvious to the eye, others in the HTML coding underneath. Suffice it to say that what was visible to the eye was the repeated paragraph on Mars near the end of the forecast. Because I don't rewrite a forecast to fix typographical and other errors, I always leave the flawed original as-is. In this case, fixing the HTML code required some code editing, so, after a couple of attempts to fix it all - dratted Mercury Max - I have made a replacement version of the forccast available here. Compare and contrast, you'll see the text is identical, but for the omitted duplicate paragraph. My apologies! Thanks to some AstroPro visitors, I have learned that a number of the PayPal order page links in my 2012 forecasts (plus the 2011 and 2012 World Forecast Hilights) are inoperable. The reason is technical, having to do with targeted link codes. Here's the properly coded link to my PayPal order page. Thanks to Noah R. for alerting me to a typographical error in my March 2013 Forecast. The passage that reads "The current Mercury Max is a contributing factor in this respect, since it is 5ypically a signal of increased solar activity – X-ray flares, Coronal Mass Ejections (CME), etc." should read "The current Mercury Max is a contributing factor in this respect, since it is typically a signal of increased solar activity – X-ray flares, Coronal Mass Ejections (CME), etc." Pardon the "fat finger" error, caused by the left index finger landing a little higher than the QWERTY row and tapping the 5 instead of the t . . . and again, thanks, Noah! Thanks to Tsandi, Janet and Rosemary for spotting a typo in my May 2013 Forecast, in the paragraph that starts "May is haping up to be . . ." There are two instances in that paragraph which refer to "the 2th" - which in fact it should read "the 25th". A paragraph got left behind on my laptop when I uploaded the June forecast last month. It reads as follows: "While the SuperMoon on the 23rd is by far the trump card in this month’s geophysical shock hierarchy, it’s not the one and only such factor to consider. There are other, lesser indicators of increased levels of strong storms (high winds, heavy precipitation – sometimes followed by floods etc. ), coastal tidal extremes, and moderate-to-severe seismic activity (Magnitude 5 and up quakes, plus newsworthy volcanic eruptions). Critical dates in this category include June 1-2 (in and around the Moon’s northward crossing of the celestial equator on the 1st), 7-17 (the north lunar declination peak on the 8th, melding into the new moon on the 12th and the Moon’s southward equatorial crossing on the 16th); and June 27-29, bracketing the northward lunar equatorial crossing on the 28th. These are lesser indicators only in a relative sense: there’s nothing lesser about them if a storm, earthquake or volcano your lays your neighborhood to waste!" I was hoping to get more than a couple days into the New Year before having to start an errata sheet on the full version of my 2014 World Forecast Highlights, but it was not to be. APR 3, 2016 There’s an extraneous “A” at the bottom of page 10 in the full version of my 2016 World Forecast Highlights, regarding the starting date of the 2016 Mars Max cycle. It reads "February 4A", but should read "February 4". Also, describing the April 7 Stealth (New Moon) SuperMoon, I inadvertently wrote Pisces when I meant to write Aries in defining its position. The actual position, as is clear from context and the accompanying chart, is 18° Aries – not 18° Pisces. This correction applies to the bottom of page 29 in the full version of my 2016 World Forecast Highlights; and to the corresponding passage in my free online April Forecast. The latter location also has a typo, in which the open parenthesis should be replaced by the degree symbol; hence "The April 7 Stealth SuperMoon is at 18(Pisces." Should read "The April 7 Stealth SuperMoon is at 18° Aries." OCT 2, 2016 Right column, wrong row: that’s what happened when I selected the image for the October 16, 2016 SuperMoon astro-locality map, which appears in my free online October forecast, and on page 33 in the full version of my 2016 World Forecast Highlights (published last year). 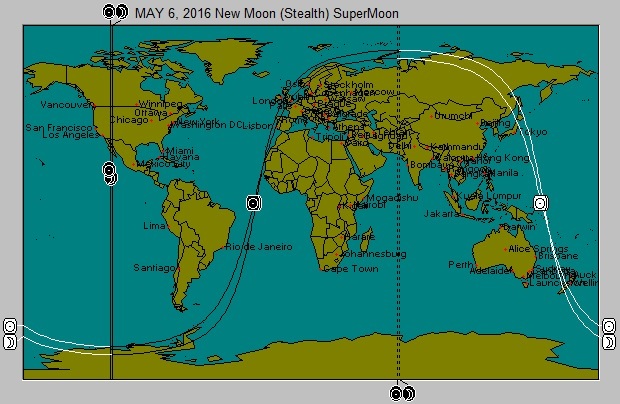 Which is to say, the map as originally published is the wrong one: it’s the May 6 New Moon (Stealth) SuperMoon. 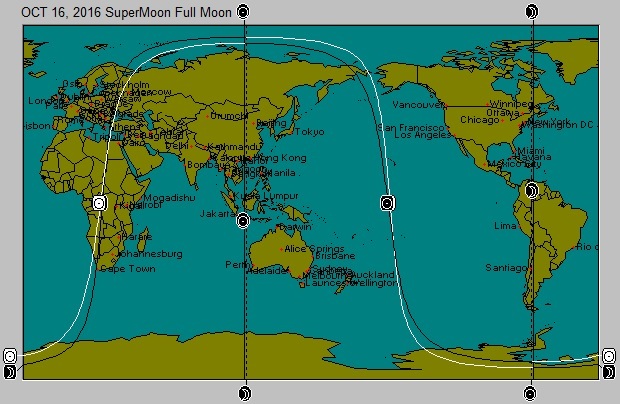 The CORRECT astro-locality map for the October 16 SuperMoon full moon is shown to the right. Compare and contrast this with the INCORRECT new moon SuperMoon (at left), and the difference is plain. All these 2016 map images are stored in a local file on my laptop. When I went to select the one for the October 16 SuperMoon, I errantly clicked on the image right above the correct one; which is what comes from working too many hours on too little sleep. I never realized the error until it was kindly pointed out a couple days ago by my Facebook friend Paulo Mendes. Thank you so much, Paulo! More to the point is the night and day difference between the target zones for the October 16 SuperMoon tidal, storm and seismic risks. The meridian line for the Sun runs through Siberia, eastern Mongolia and China, the east coast of the Indochina peninsula, down through the South China Sea to the west coast of Indonesia and southward to the west coast of Australia (near Perth). On the other side of the planet, the Moon’s meridian line runs northward from Argentina and Chile through western Bolivia and Brazil, and along the Colombia-Venezuela border and out into the Caribbean Sea to cross Puerto Rico. From there, the Moon’s meridian line heads northward through the Atlantic to pass over Maine, New Brunswick, eastern Quebec, and Newfoundland and Labrador, across Baffin Bay to the northwestern tip of Greenland. The curving horizon arc for the Sun and Moon sweeps northeasterly through central Africa and Eastern Europe, before bending southward through the Bering Strait down through the Aleutians and on into the Pacific to cross Hawaii and head southeasterly from there. Regulars know the usual cautions: being astronomical in scale, the amplified tidal, storm and seismic potential associated with the SuperMoon is planet-wide in scope. In short, there is no place on Earth that will not feel the surge in disturbances of the atmosphere, crust and seas during the October 13-19 geophysical shock window. That said, the astro-locality zones described above will likely feature prominently in the news of the day during this period. My August 2017 forecast contains a typographical error in paragraph 16, which refers to "the August 21, 2014 eclipse": make that August 21, 2017. (It should be clear from context, but I hate when that happens.) Thanks to Susi in Switzerland for bringing this to my attention! Thanks to my FaceBook friend and fellow astrologer Janna Lyn, for pointing out a confusing typo in my February 2018 forecast. It’s near the bottom of the section entitled “Groundhog Day/CandleMas/Imbolc, where (referring to Pres. Trump) it reads "Imbolt is also conjunct his natal Pluto." Instead of "Imbolt", that should read "Imbolc". Thanks to my eagle-eyed friend Andrea Arden for spotting an error near the end of the third-to-last paragraph of my April 2019 forecast. The paragraph begins with the line "President Trump is far from the only person." The line several setences below that reads "Nicolas Maduro gets the Saturn-Uranus right on the descendant." It should read "Nicolas Maduro gets the Saturn-Pluto right on the descendant."